I thought about writing this review a few months ago but never found the time to get it done. But here it is and I hope you enjoy this cool paper as I did. 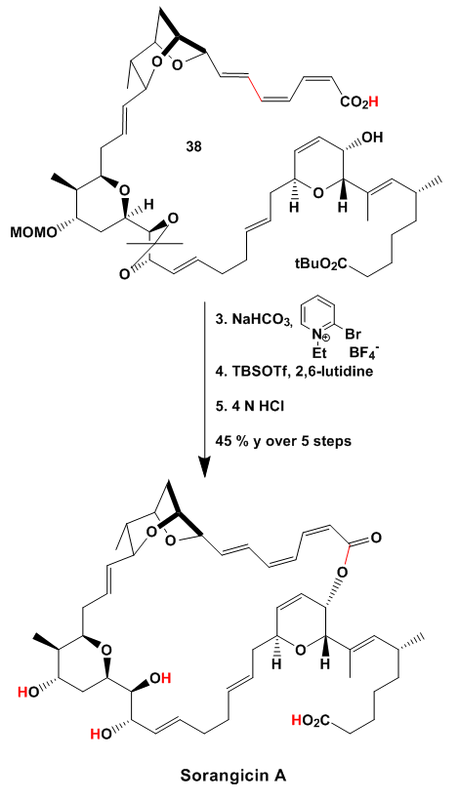 I am a big fan of “flat” chemistry and C-H activation so naturally this piece had to be reviewed. Dragmacidin D itself shows some promising activity in the treatment of neurodegenerative diseases like Alzheimer’s or Parkinson’s disease. 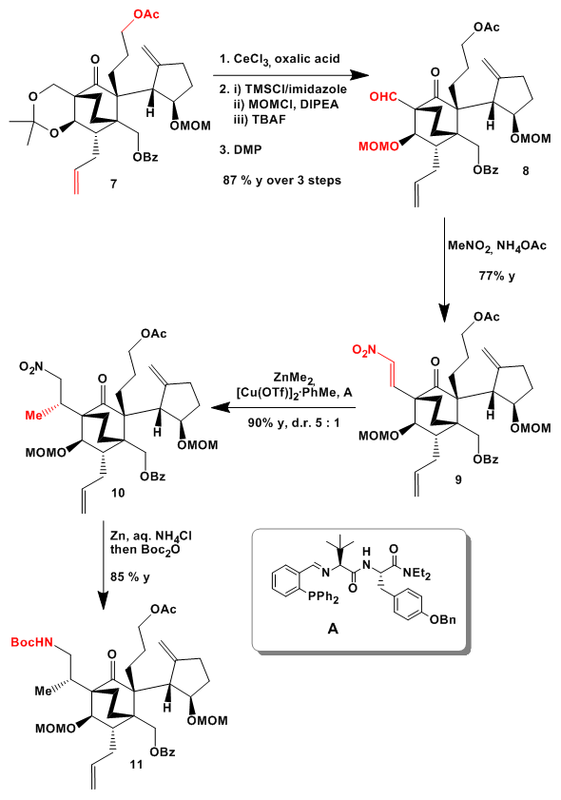 Only one total synthesis has been published by the Stoltz group in 2002 so there is still room for improvement. 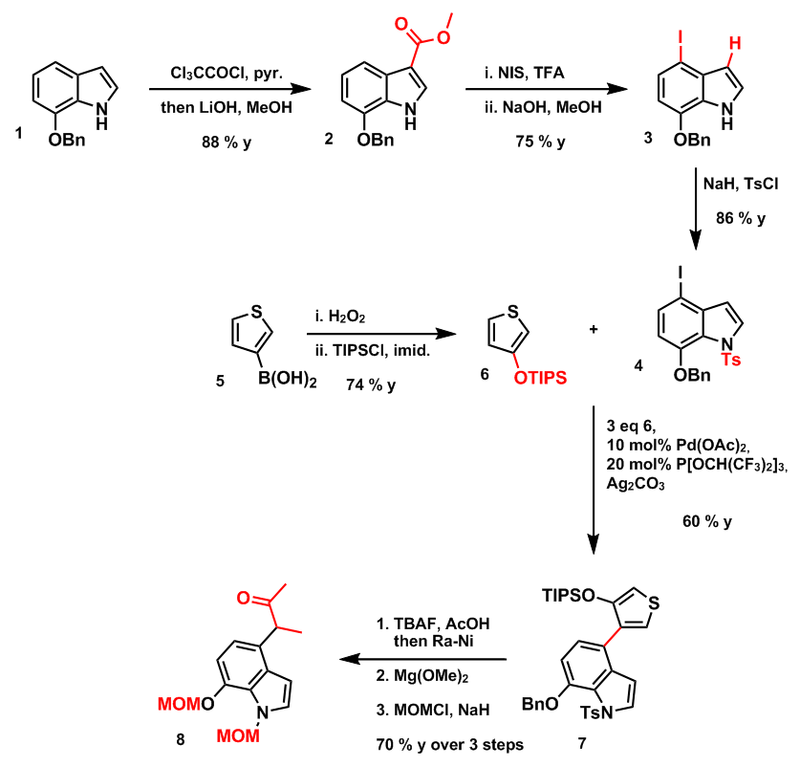 Retrosynthetically the group planned to stick all parts together via C-H activation/C-C coupling reactions. The “sticky” –positions are marked in blue. 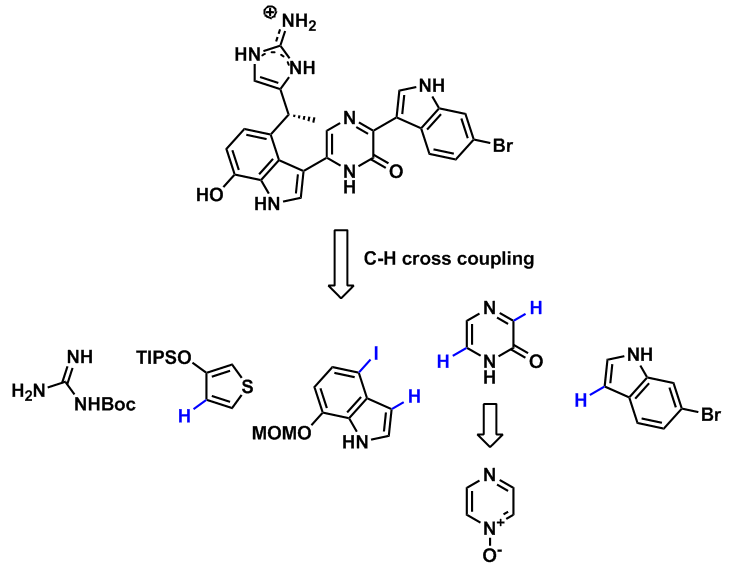 As can be seen from this picture almost all crucial bonds can be formed through C-H activation (except the iodide). 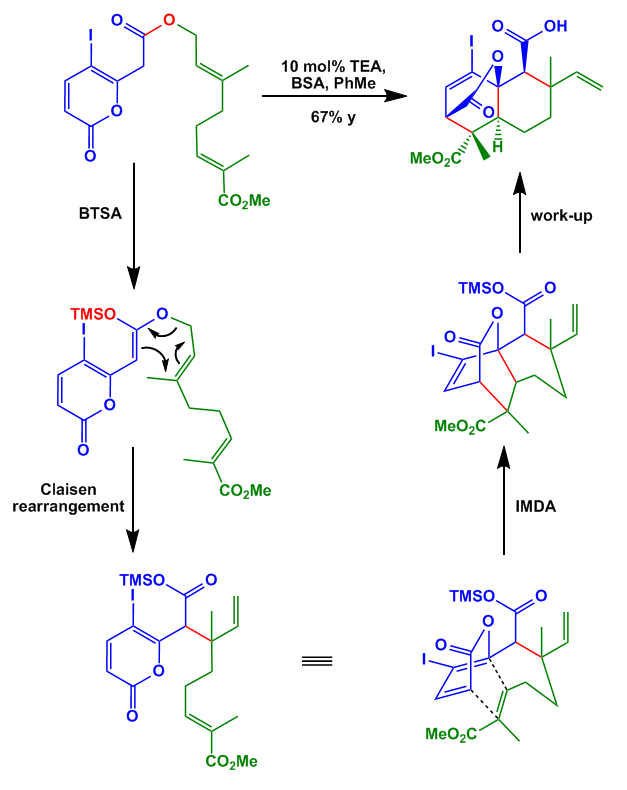 Next the 3 position of the indole moiety was again functionalized. This time pyrazine N-oxide was used in the presence of PdII to give 9. 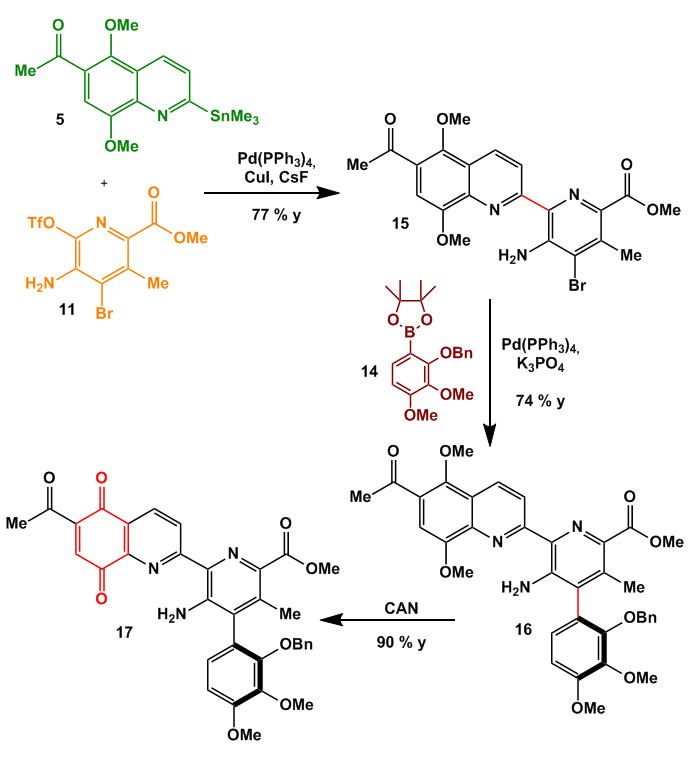 A TFAA mediated Polonovski-Potier rearrangement gave pyrazinone 10 which was used in a Friedel-Crafts-like acylation with 6-bromoindole to furnish 11 in good yield. 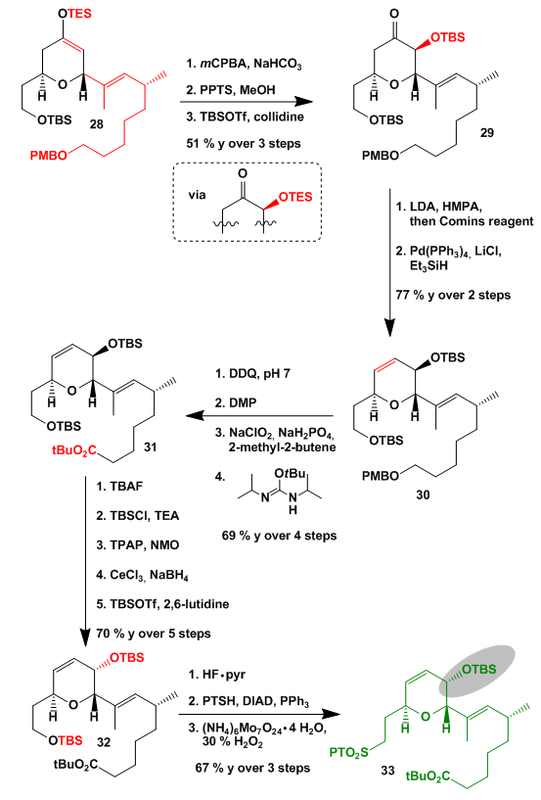 Bromination of the ketone was accomplished via the TMS-enolate and NBS mediated bromination yielding 12. 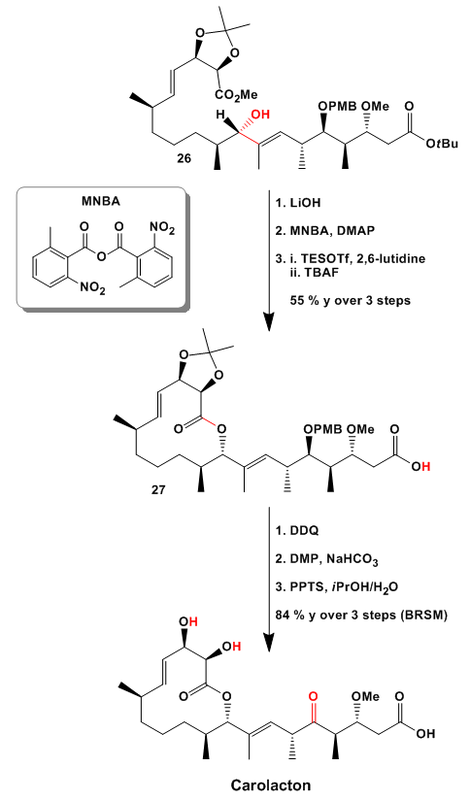 In the presence of Boc-guanidine Dragmacidin D was formed after deprotection. Short and very efficient I would say. 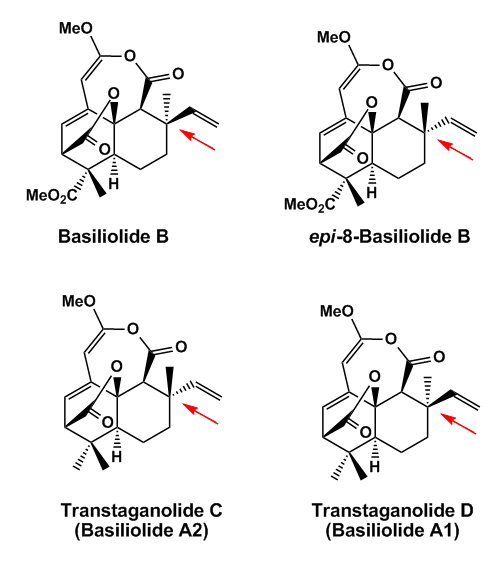 The only drawback might be that Dragmacidin D is formed in both enantiomeric forms. I was wondering how much silver the group stores in their laboratories J. Really a nice method to introduce the side chain on the indole. The net result is the reaction of an umpoled ketone with the aromatic ring. 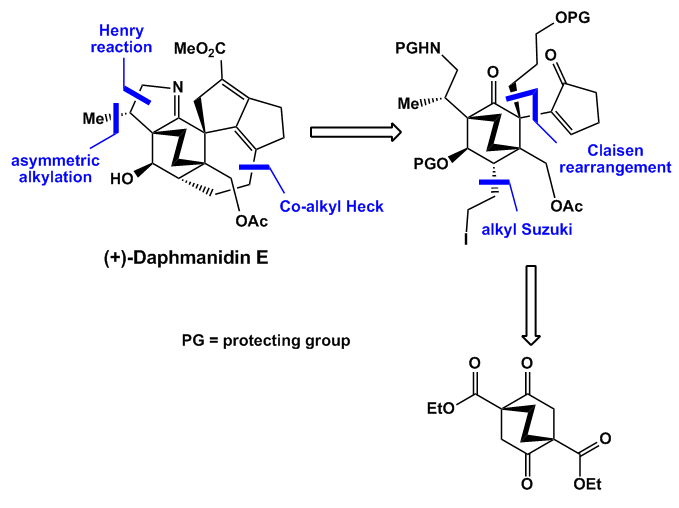 (+)-Daphmanidin E. The biological profile is rather unspectacular which can be explained with low supply of material. 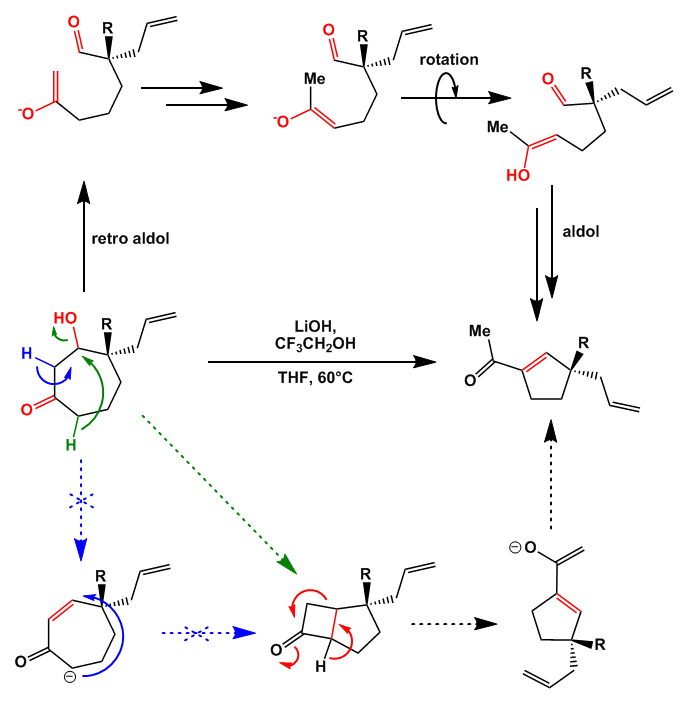 The synthesis features as one of the key steps a very cool Cobalt catalyzed Heck cross coupling reaction of an alkyl iodide. If you are further interested, as I am, take a look into this review (Chem. Rev. 2010, 110, 1435–1462). 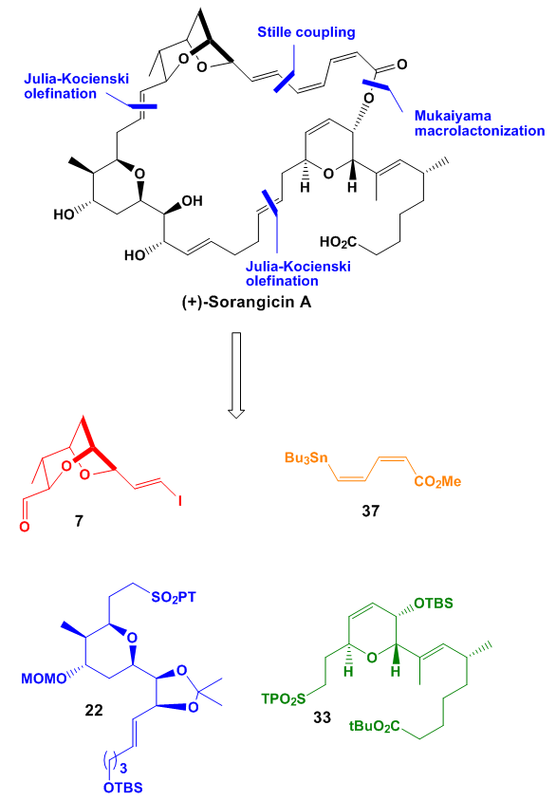 Starting from known building block 1 which is available in racemic form by some really old procedure the group used chemoenzymatic resolution to get enantioenriched 1. I think this citation might be the oldest one I used to date. It is only available in german… I like this old stuff and the nice language they use. Because the supporting information was not online while I wrote this review I cannot give you the yield of the resolution step (maybe later…). 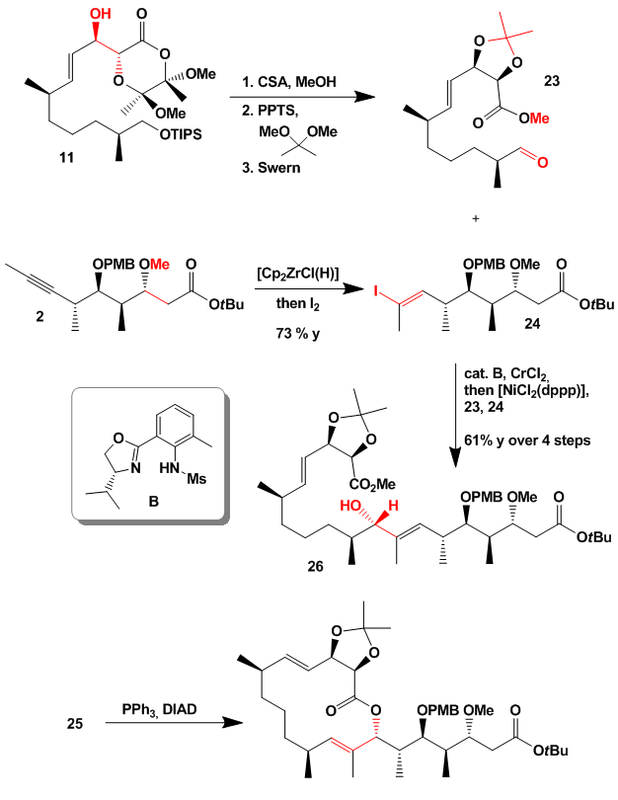 Going on with the synthesis the group first desymmetrized the C2-symmetric building block by an acetal formation. 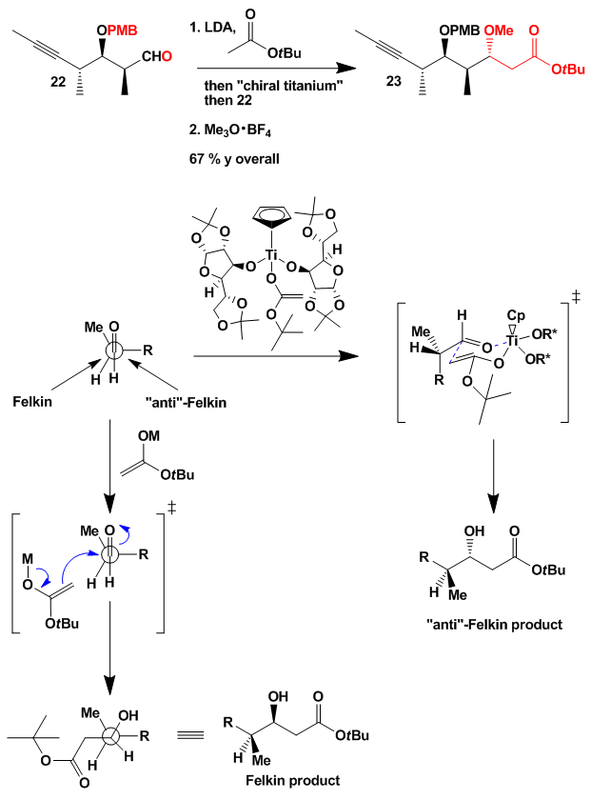 Triflate formation using Comin’s reagent then gave fragment 2. 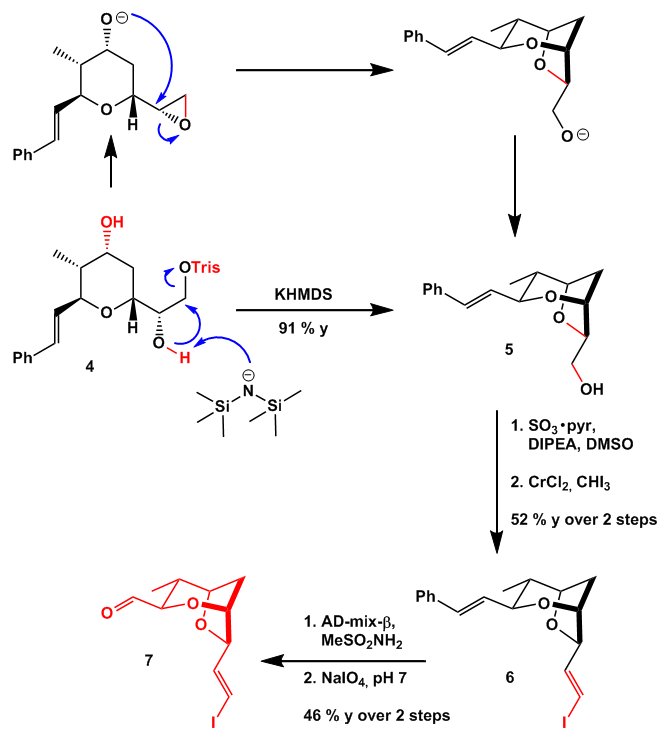 In situ hydroboration of TBDPS-protected allyl alcohol and Suzuki coupling in the presence of Ph3As as the ligand added the first side chain which was later used for the crucial Heck reaction. 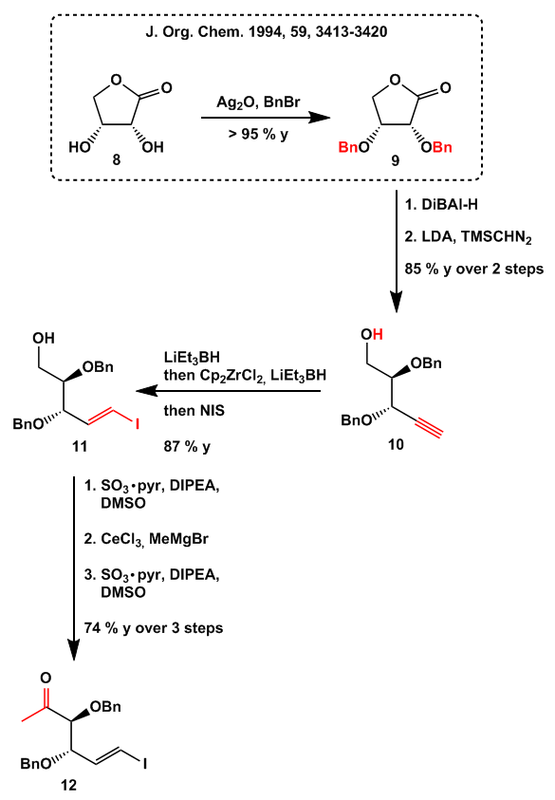 Ph3As was essential for this step due to a de-triflation side reaction when phosphine based ligands were employed. 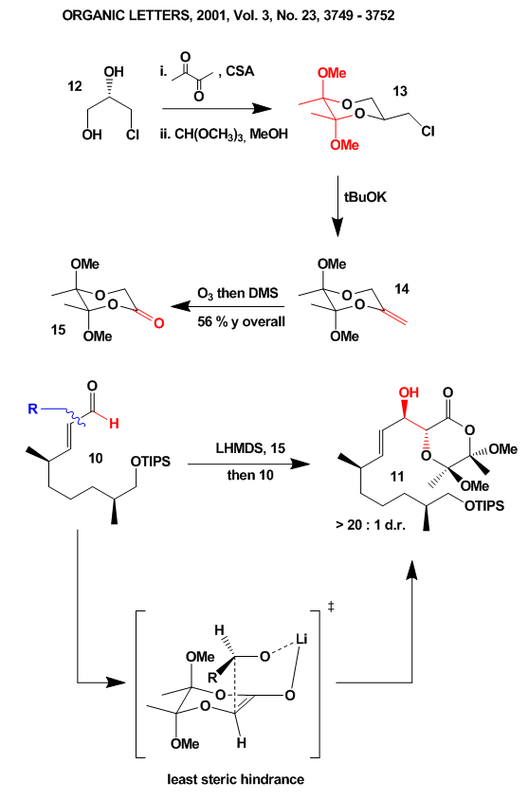 Hydroboration/oxidation and subsequent global reduction was followed by diol protection/acetal cleavage and benzoylation of the second primary alcohol to furnish 3. 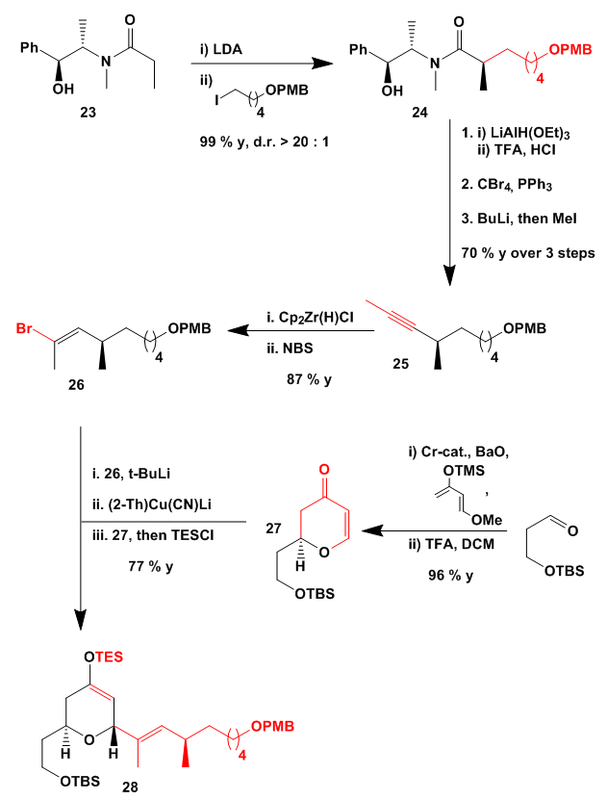 O-alkylation of the corresponding enolate then produced enol ether 4. 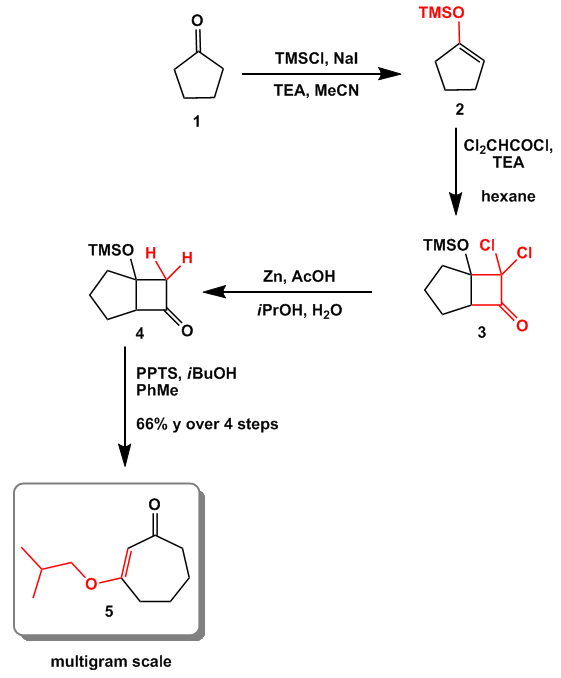 The subsequent Claisen rearrangement gave ketone 5 which was again alkylated and rearranged to give ketone 6 with an extremely densely functionalized cyclohexane core, and three quaternary stereocenters. 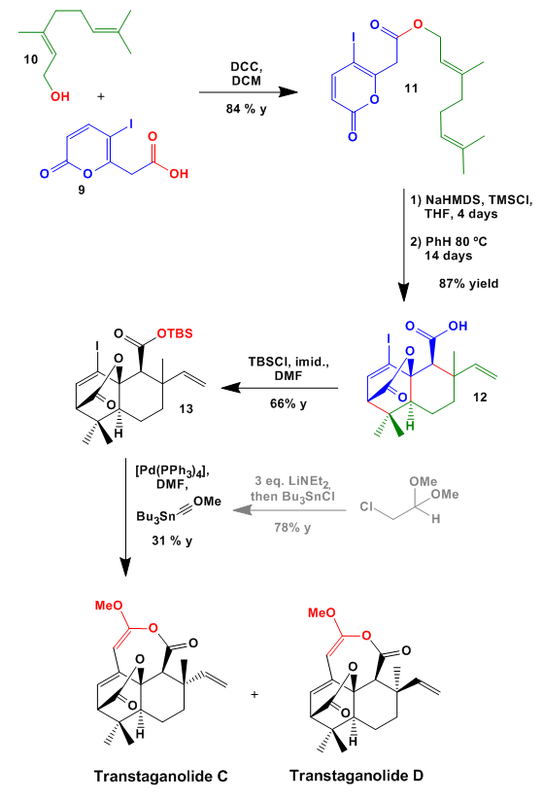 Selective hydroboration/oxidation of the least hindered methylene group was followed by acetylation and TBDPS removal. Selenation/oxidation/elimination according to Grieco’s protocol produced 7. 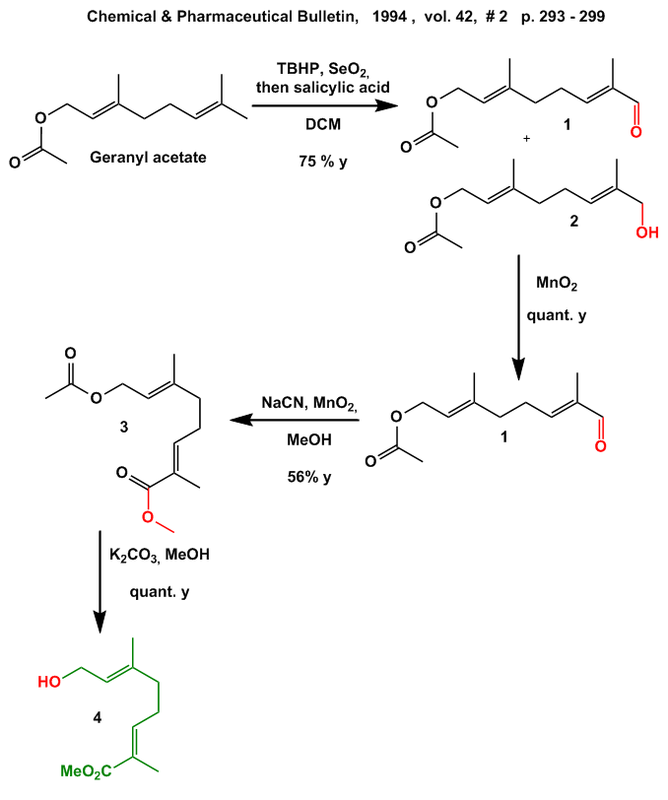 Selective removal of the acetonide was accomplished with a mixture of cerium trichloride and oxalic acid. 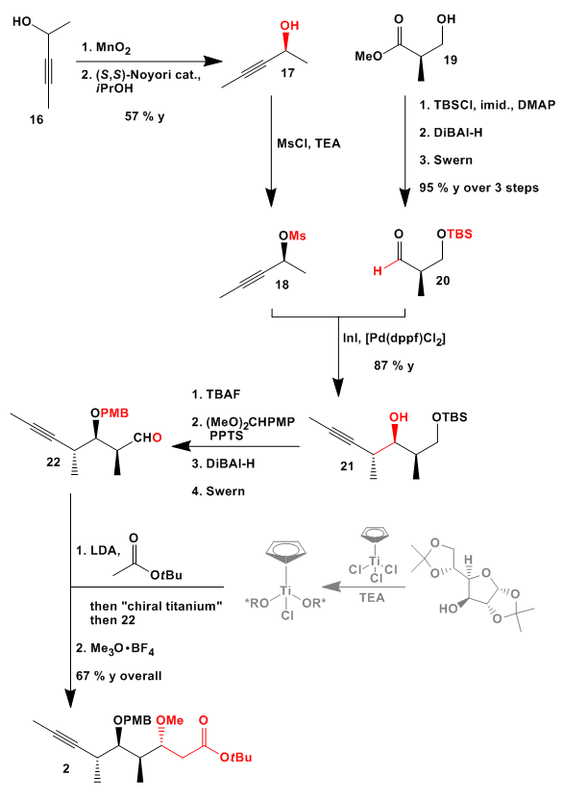 Alcohol differentiation was achieved by protection of the primary alcohol with TMS, MOM-protection of the secondary one and desilylation. 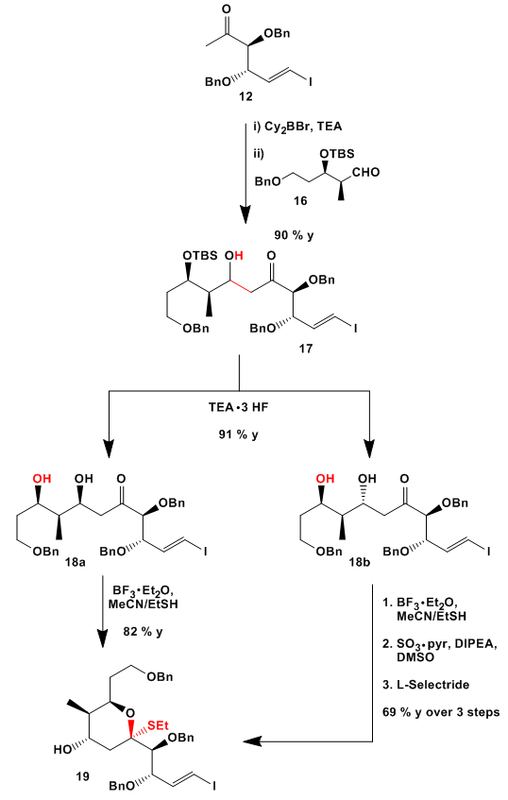 DMP oxidation then furnished aldehyde 8. Henry reaction with nitromethane was used to introduce the nitrogen atom into the system. 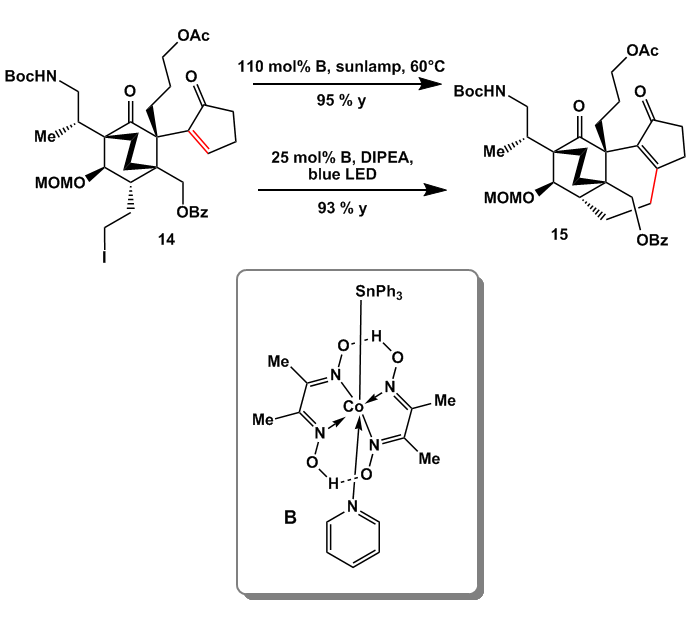 After some efforts the group identified conditions to introduce the asymmetric methyl group by using one of the ligands published by Hoveyda et al with dimethylzinc as the nucleophile. 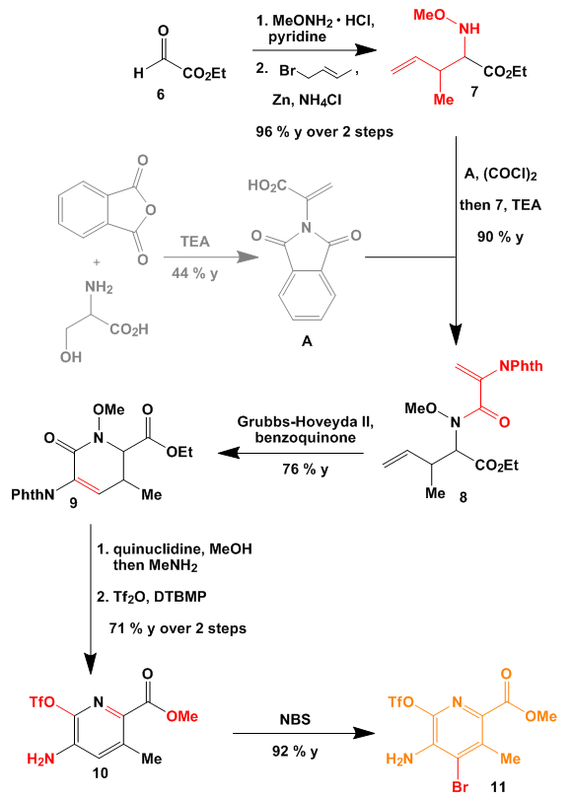 Reduction of the nitro group and Boc-protection of the amine gave ketone 11. 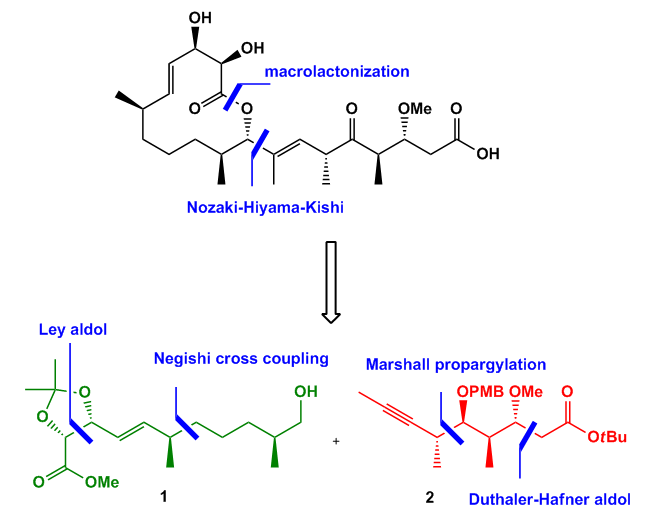 Next both carbonyl groups were unmasked by ozonolytic cleavage of the methylene groups from which the aldehyde was chemoselectively reduced. 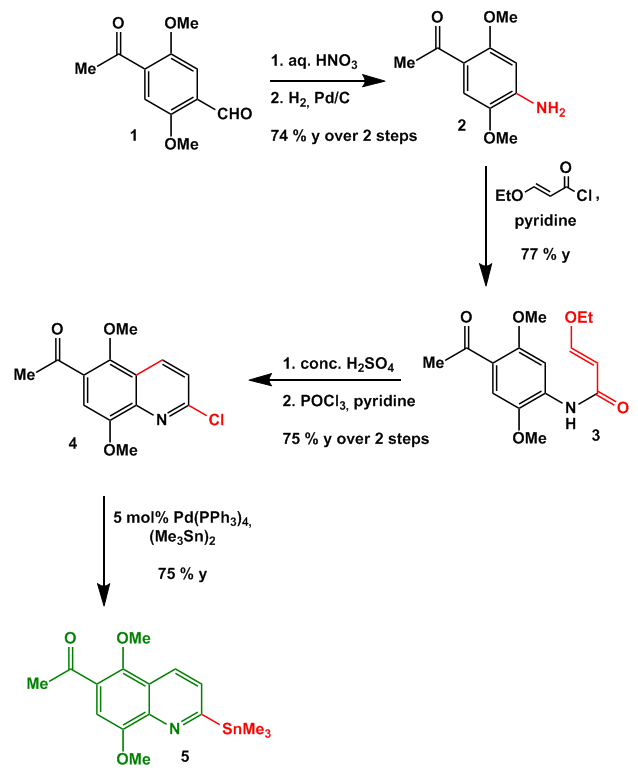 A Finkelstein reaction of the corresponding mesylate gave iodide 13 from which the MOM-group of the pentanone ring was eliminated. Interestingly the iodide survived under the reaction conditions. 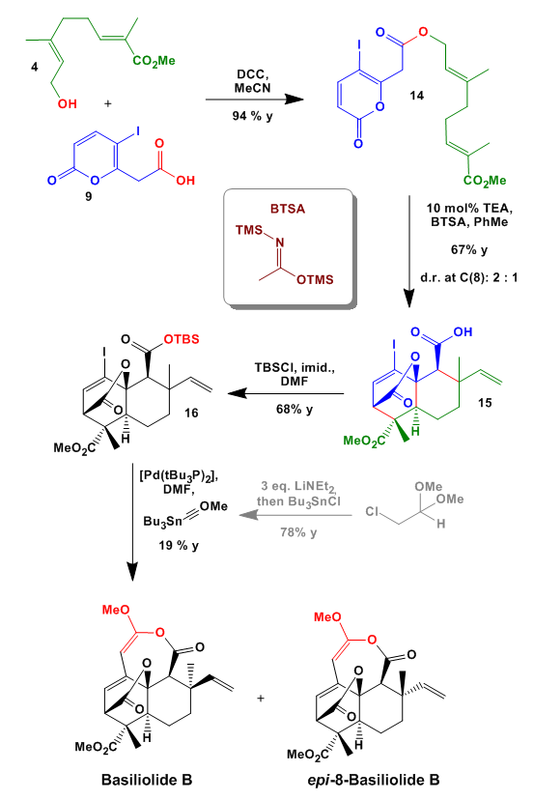 And here is the key step: By using catalyst B in a stoichometric amount, and after a lot of trials under different conditions, the group closed the seven-membered cycle. Some efforts later the group found that only a catalytic amount of B was necessary to get the reaction done, when DIPEA was added to the mixture. The scope of this remarkable key step will be part of a separate paper. 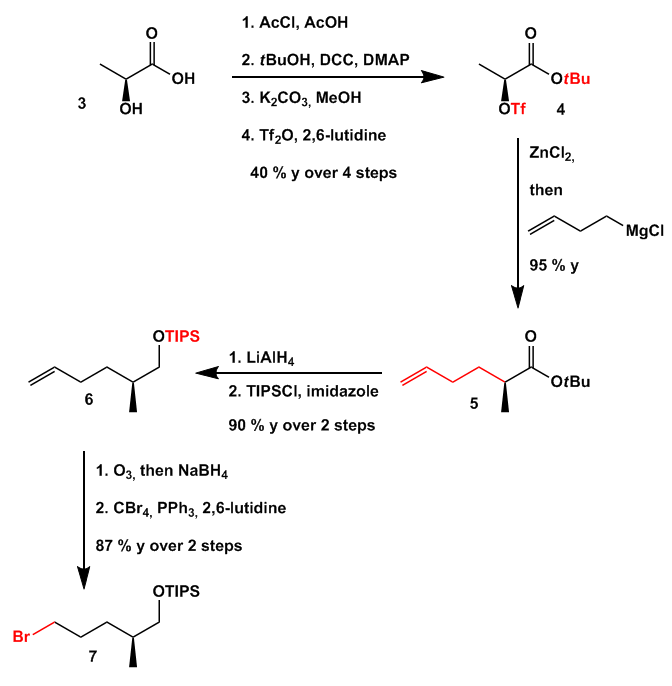 The last steps of the synthesis include first a deacetylation (in the presence of the benzoyl protecting group). 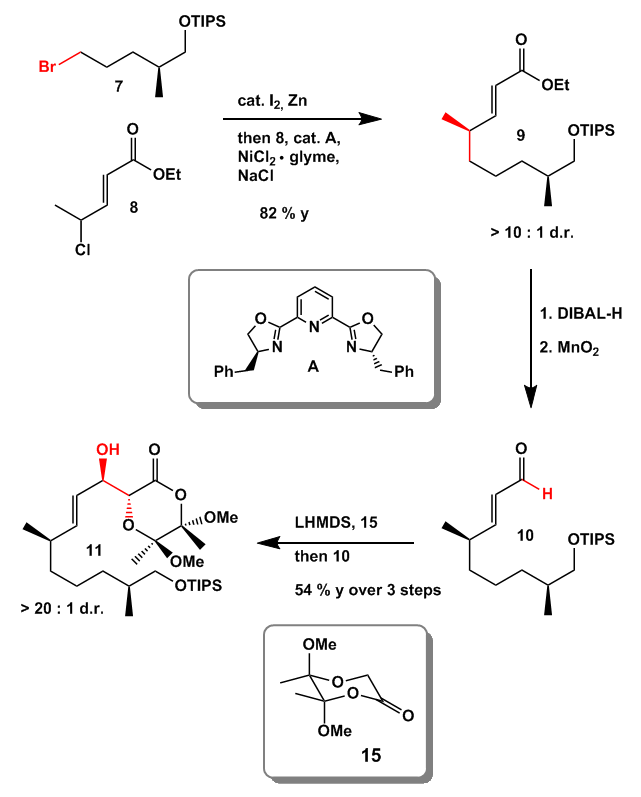 Oxidation and base catalyzed aldol condensation gave aldehyde 16. 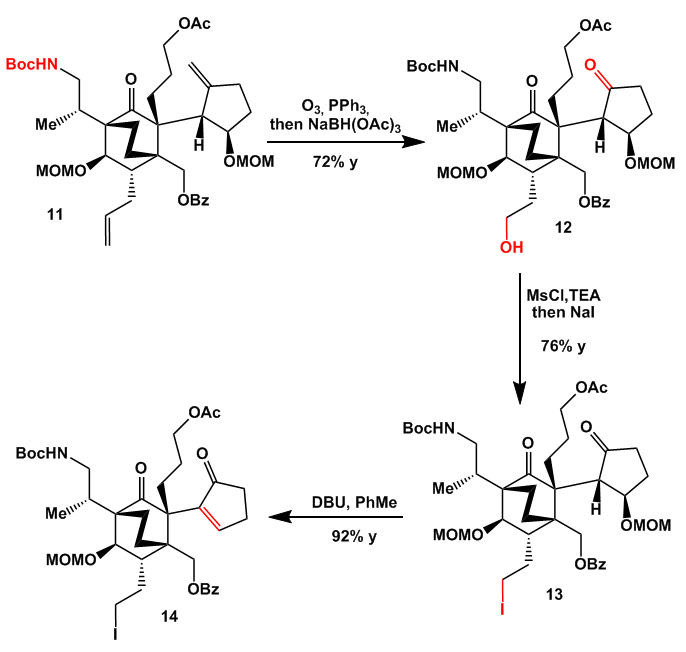 Ester formation under Corey’s conditions (MnO2 and NaCN in MeOH) was followed by protecting group exchange from benzoyl to acetyl to give 17. 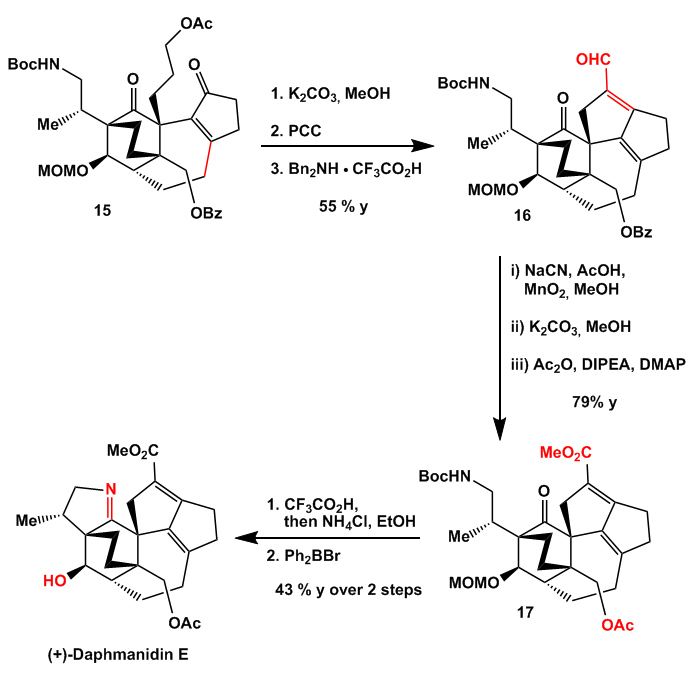 Boc-deprotection and simply heating the free amine in EtOH gave after MOM-removal Daphmanidin E in good yield. Hell yeah… Really nice work, as usual. Interstingly only one co-author with respect to Prof. Carreira is mentioned in the title. The stage is open for discussions. I selected this post to be featured on my blog’s page at Science Blogs. 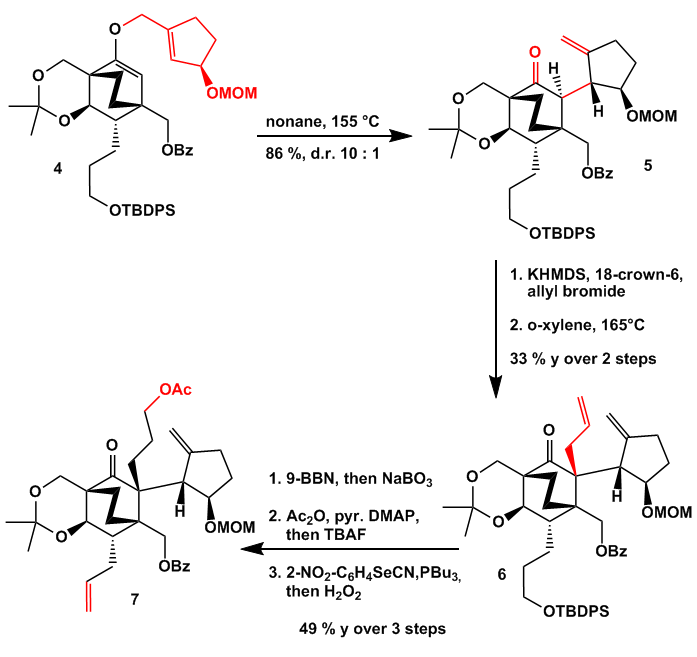 Recently a very cool methodology was published developed by the Stoltz group for the synthesis of acylcyclopentenes . As given in the paper a lot of natural products are related to this motif so there is a need for an easy and rapid access. 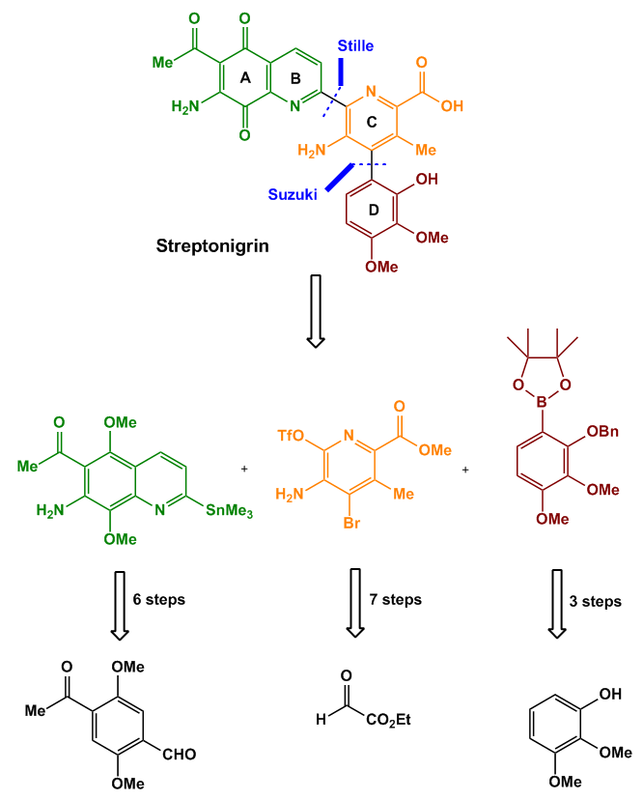 As can be seen from the structures given these natural products mainly derive from the MVP-pathway. 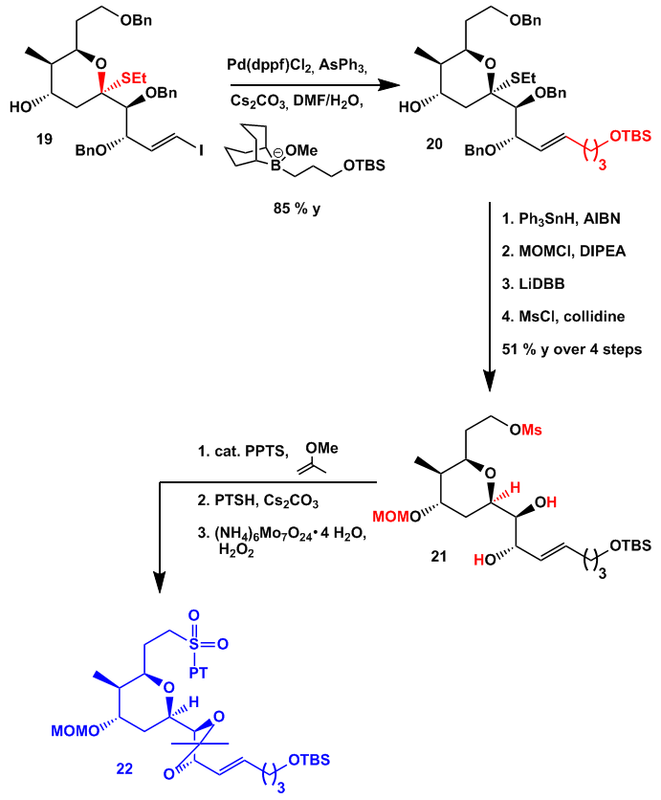 Nevertheless this method should also prove useful in the synthesis of alkaloids or polyketides. 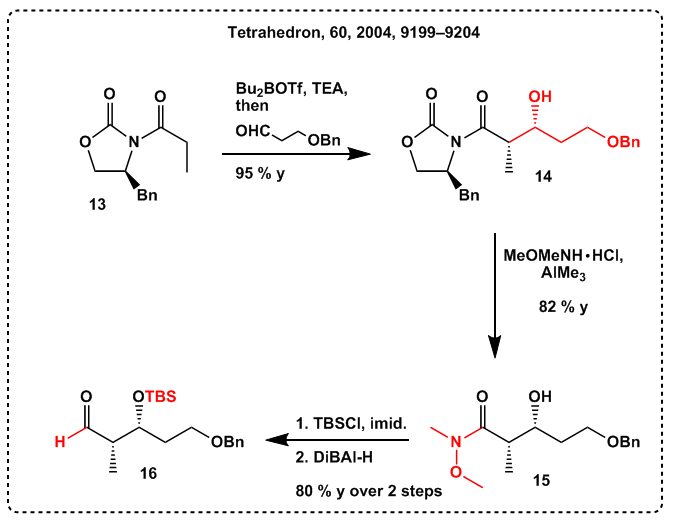 Cyclopentanone 1 was enolized, protected as the TMS ether, and reacted with in situ generated dichloroketene to give cyclobutanone 3. 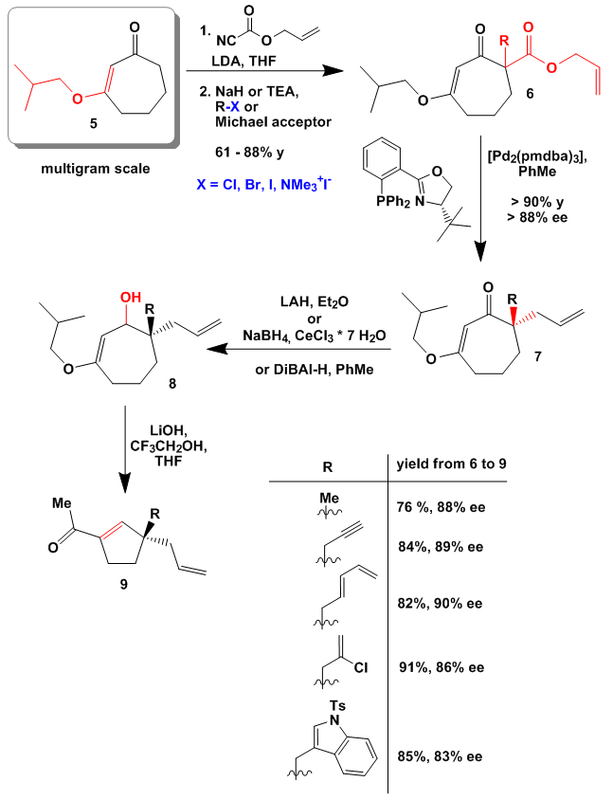 Reductive dechlorination and Grob fragmentation/ether formation produced ketone 5 in good yield on a multigram scale. 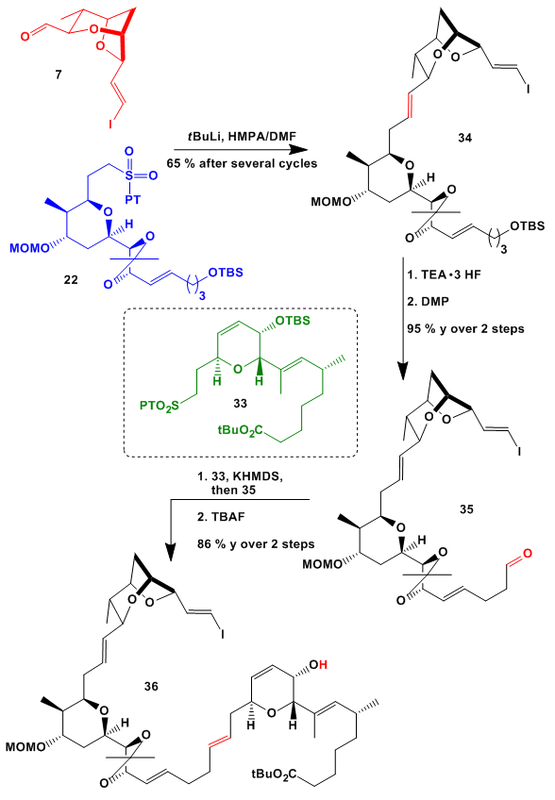 This was then decorated with different organic residues in two steps to give ketoester 6 in moderate to good yield. 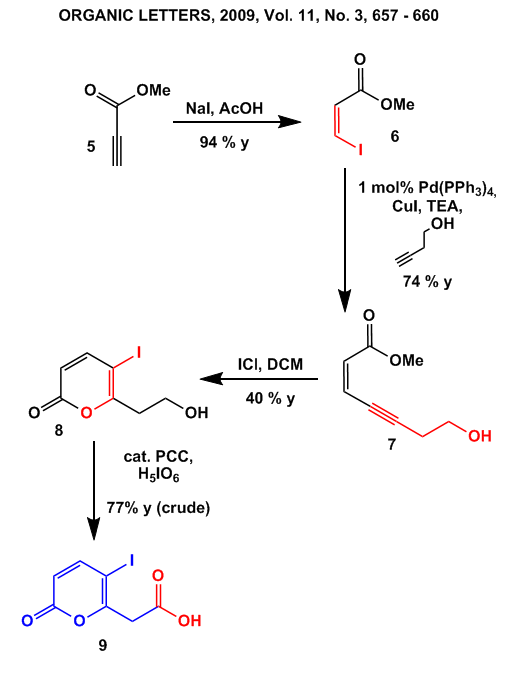 Pd-catalyzed enantioselective decarboxylation/allylation was followed by reduction of the keto group to give 8. Depending on the residues three different reducing conditions are described. At last the critical contraction reaction from 8 to 9 was carried out with LiOH in THF in the presence of TFE in excellent yield. 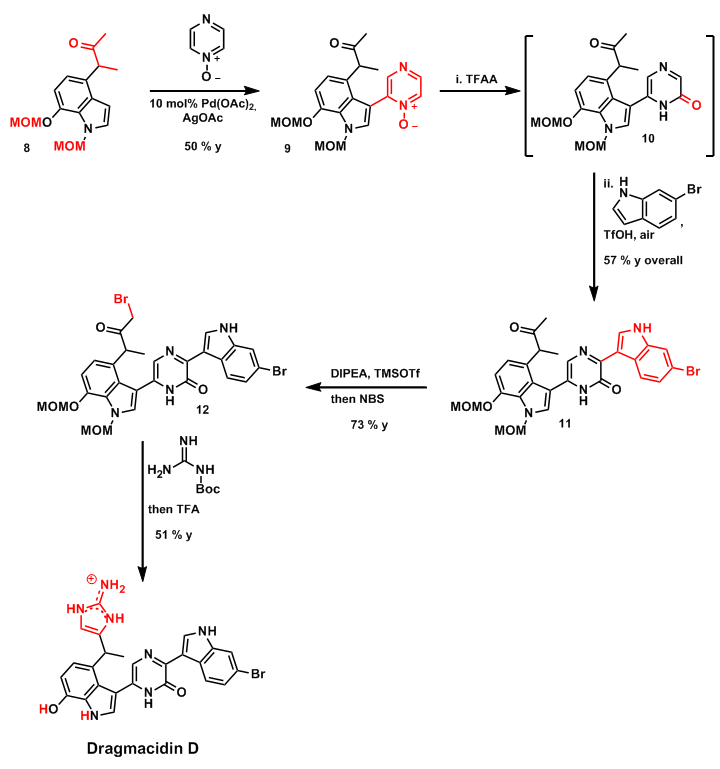 A lot of residues are described; I only added just a few to give a brief insight. For detailed information have a look in the more than 250 (!) pages thick supporting information. 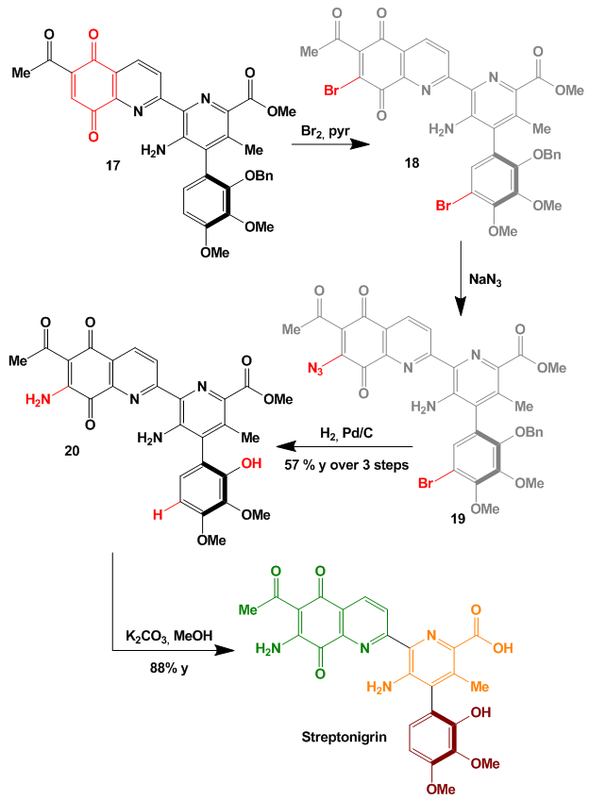 The mechanism of the contraction step might look like this: the green proton leaves first and kicks out the red hydroxy group to produce directly the cyclobutanone-intermediate. 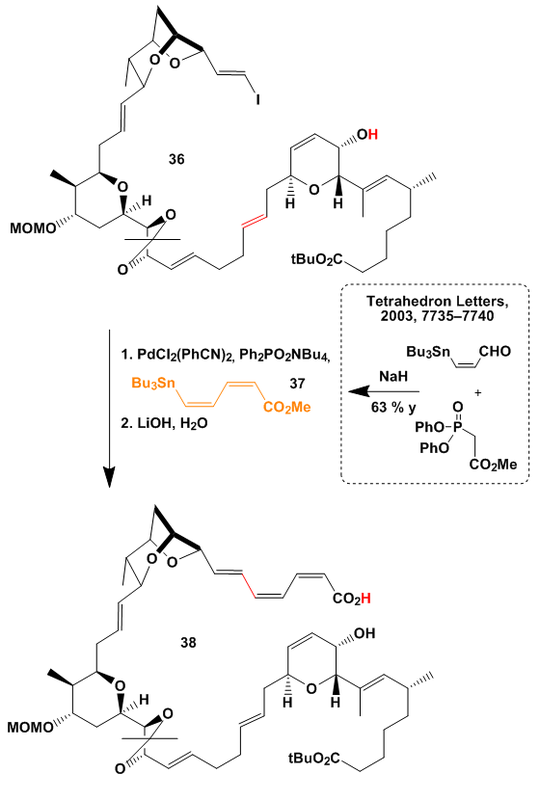 This opens up with extrusion of the acetyl group to give after reprotonation and tautomerization the expected product. 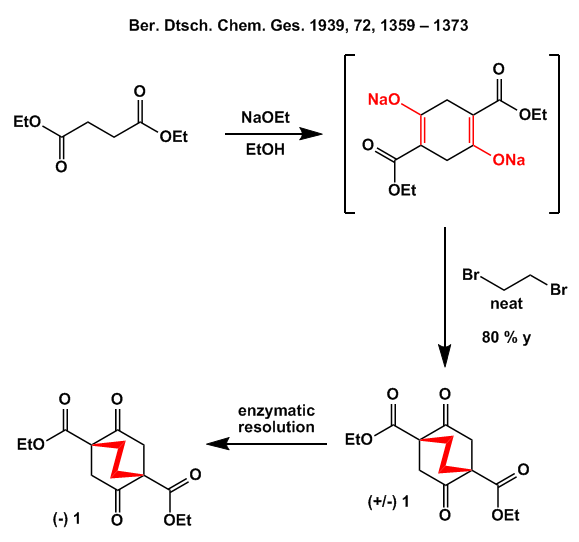 If you think about the second possibility of first removing the blue proton followed by a Michael-type self-addition of the enolate, generated from deprotonation of the ketone, then you are missing the Baldwin rules (as I did at first sight). 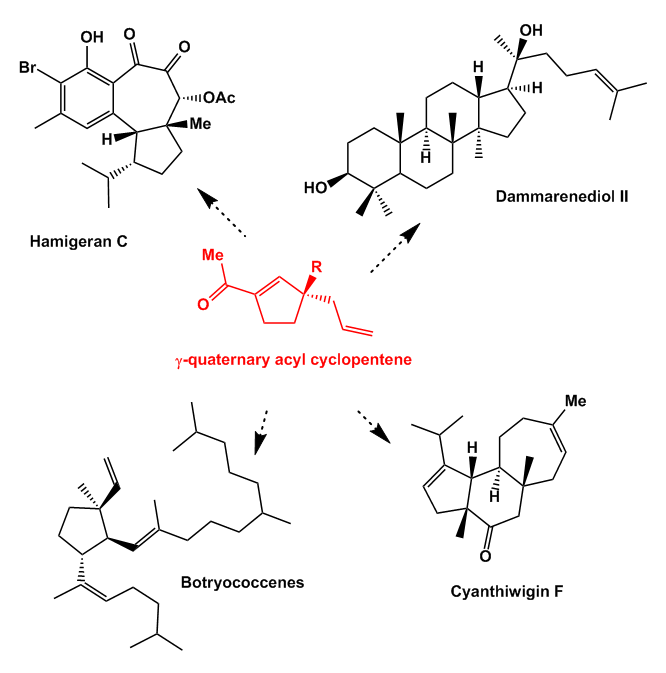 One of the many special examples which I picked out from the supporting information is the synthesis of the Hamigeran C core structure. Starting from cyclopentene 9 the terminal olefin was elongated with iodophenol in a Heck reaction to give 10. 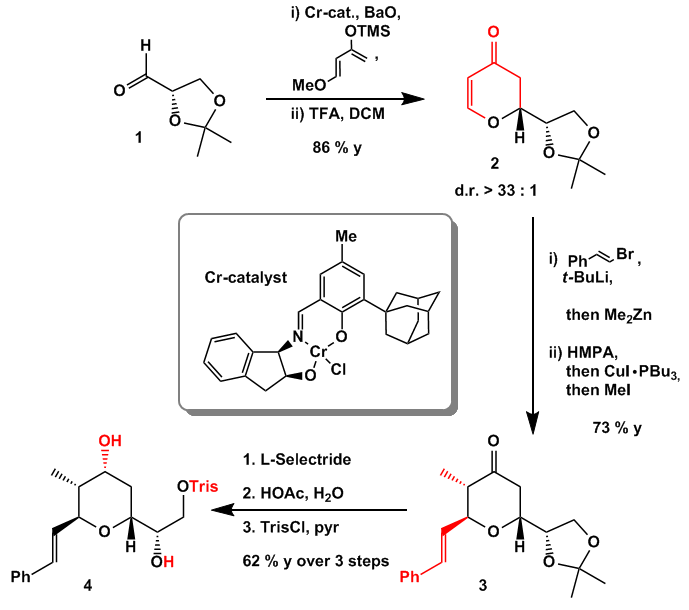 Chemoselective reduction of the styrene double bond and triflate formation was followed by another Heck reaction employing Herrmann’s catalyst to give tricyclic compound 13. 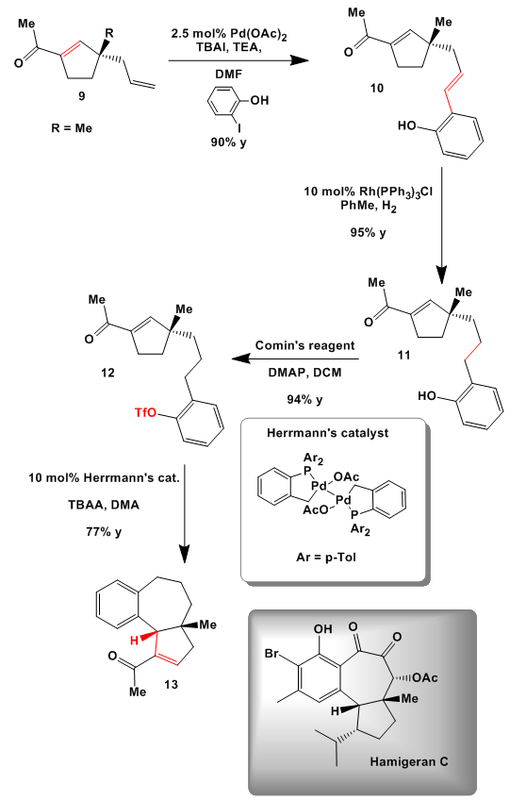 First time I have seen Herrmann’s catalyst, funny German name. 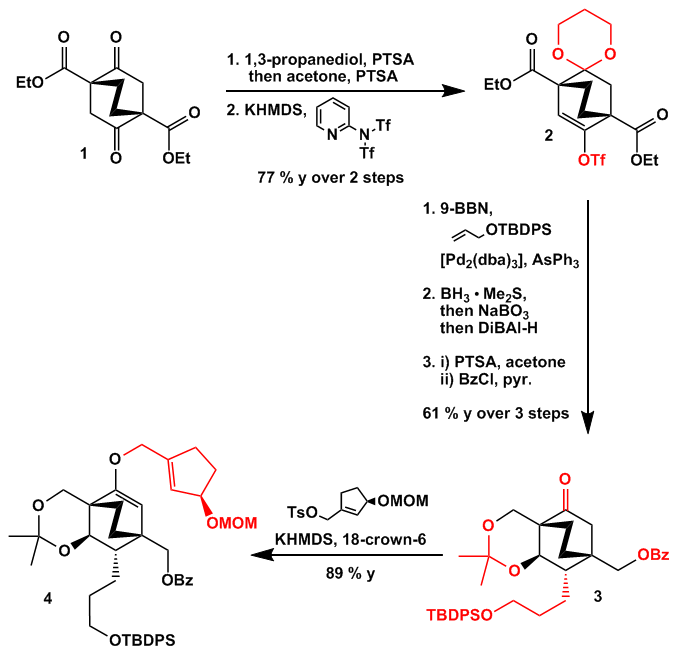 Nice methodology as usual from the Stoltz group. Any comments? And special thanks to Bobby for proofreading my post in advance!